Tompkins County should be a place where the needs of current and future generations are met without compromising the ecosystems upon which they depend. Sustainability means equitably meeting the needs of all community members now and in the future. This includes ensuring that everyone has a wide range of choices that allow them to share in economic prosperity, live in a healthy environment, and participate in community life. It requires preserving biodiversity and natural ecosystems and conserving resources to ensure their ability to sustain future generations. It further entails advancing economic vitality, environmental stewardship, and social equity simultaneously -- by making sure a decision to advance one of these does not come at the expense of another. The Tompkins County Sustainability Strategy (0.20 MB) provides a coordinated approach to integrating sustainable practices into Tompkins County government operations. Developed by County employees who serve as members of the Tompkins County Sustainability Team, the Strategy was endorsed by the Tompkins County Legislature in 2014. The Strategy provides objectives for each of eight categories, along with actions that departments and individual employees can take to achieve these objectives within a five year timespan, and measures of success that provide a means to review progress in meeting the objectives. The NYSERDA-funded Cleaner Greener Southern Tier Plan was developed with input from community residents, businesses, and public and private experts across a wide range of fields to develop a regional sustainability plan and a set of 'Top 22' priority projects that will improve the economic and environmental health of the area. 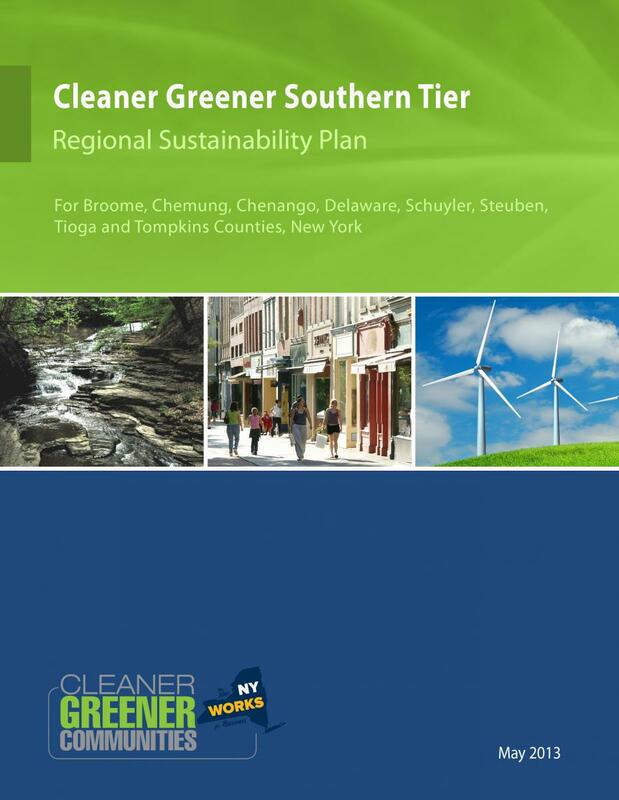 The plan provides a map to a sustainable future for the Southern Tier and will be used to help guide regional decision-making and state and local investments in integrated, sustainable solutions. The 2004 Tompkins County Comprehensive Plan identified a need to sustainably manage the 558 acres of forest lands owned by Tompkins County. The overarching purpose of this plan is to provide for the sustainable management of Tompkins County’s forest lands.